Fool me once, shame on you. Fool me twice, shame on me. That's how I am feeling about the Jacksonville Jaguars entering the 2017 season. I thought the Jags could be a breakout team in the AFC last season along with the Raiders. Now, I wasn't projecting a Super Bowl or anything for the Jaguars but perhaps playoff contention and at least graduating to a .500 record. If you look at some recent Jacksonville drafts, this team has a ton of young talent - especially on defense. The defense, led by dynamic rookie cornerback Jalen Ramsey (the next Patrick Peterson or Richard Sherman or name your shutdown CB), was much better in 2016. It ranked sixth in yards allowed. However, Jacksonville allowed 25.0 points per game (25th) largely because its offense put the defense in bad field position because of turnovers. Specifically, Blake Bortles did. Bortles improved a great deal in 2015, his second season, throwing for 4,428 yards and 35 touchdowns, although the 18 interceptions were too many. Still, natural progression assumed an even better third season for Bortles in '16. It didn't happen. His yardage dropped to 3,905, his TDs fell to 23 and he threw 16 picks. Frankly, his mechanics went backward. This guy has given the ball away a league-high 63 times since his rookie season. The Jags did pick up his rookie fifth-year option for 2018, which was surprising considering that will be worth $19 million. The Jags are set to pay Bortles about $3.2 million in the final year of his standard rookie contract in 2017. Their thinking is that you add the two years together and it's a two-year, $11 million average. That would certainly be a steal for even an average NFL starting QB. Plus the fifth-year option is guaranteed for injury only. I still like this team, with the addition of rookie running back Leonard Fournette, although I wish ownership had been a bit more imaginative this offseason in hiring a head coach. The Jaguars went with Doug Marrone. He replaced a fired Gus Bradley for the final two games last year and the Jags went 1-1. Apparently they showed enough for Marrone to get the full-time gig. Jacksonville thought about bringing back former coach Tom Coughlin in the role but instead he was hired as executive vice president of football operations. Jacksonville was 1-7 on the road last season, 5-3 against the spread and 4-4 "over/under." The Jaguars travel to just two playoff teams in 2017: Houston and Pittsburgh. They have three sets of back-to-back road games but not a single prime-time game overall. I'd say the home slate is slightly tougher but both are quite easy. I project a 3-5 road record. Odds listed for the home team. Sept. 10 at Texans ( -4.5, 43): If the Jags want to make the playoffs, this is huge and I'm not kidding. Win this, and I believe Jacksonville could start 4-0 and is a solid 5-2 entering its bye week, with the post-bye schedule setting up nicely. It's the first time these two ever open against one another. The Jaguars lost 21-20 in Houston in Week 15 last year. They blew leads of 13-0 in the second and 20-11 in the fourth. Bortles was just 12-for-28 for 92 yards and a pick. Bradley was fired after the game. Key trend: Jags 1-6 SU & 3-4 ATS in series as at least a 4.5-ponit road dog. Oct. 1 at Jets (-1): Jacksonville hosts Baltimore in London the previous Sunday but opted not to take its bye week. The Jaguars have won only seven road games over the past six seasons, but they should take this one. Jacksonville is looking for its first road win against the Jets since capturing a 24-22 victory on Nov. 15, 2009. Key trend: Jags 0-7 SU & ATS all-time as a road dog of 2 points or fewer. Oct. 8 at Steelers (-9): Clearly the toughest road game, but already Jacksonville is done with playoff teams in away matchups after this. The Jaguars have lost their last three against the Steelers and haven't won at Heinz Field since a 29-22 victory on Dec. 16. 2007. Key trend: Jags 4-5-1 ATS in past 10 as road dog of at least 8 points. Oct. 22 at Colts (-6.5): Jags off a home matchup vs. the Rams and ahead of their bye. Jacksonville hasn't won at Indianapolis since Sept. 23, 2012, the team's first game against Andrew Luck. Colts won 24-20 in Week 17 last year at home on a last-second TD pass. The Jags had taken a 20-17 lead on a field goal with 1:33 left following a blocked punt. Bortles threw for 301 yards and a TD. Key trend: Jags 1-9 SU & 6-4 ATS in past 10 in series as road dog of at least 6 points. Nov. 19 at Browns (+3): Jacksonville plays the Chargers the previous Sunday. Cleveland is the only team on the 2017 schedule that the Jaguars have a winning streak against coming into the season. They have won the past two meetings (last in 2014). Key trend: Jags 4-5-1 ATS in past 10 at AFC North teams. Nov. 26 at Cardinals (-6.5): It's Jacksonville's first-ever trip to University of Phoenix Stadium. The Jaguars have lost their last two games against the Cardinals but won their only matchup at Arizona in 2005. Key trends: Jags 2-8 ATS in past 10 at NFC West teams. Dec. 24 at 49ers (+1): Jags come off a three-game homestand that concludes Week 15 vs. Houston. Wow, Jags get to host arguably the three-worst teams in the NFL in NY Jets, Cleveland and San Francisco. No reason for this team to not finish .500 or better. The Jags and 49ers are tied 2-2 all-time. 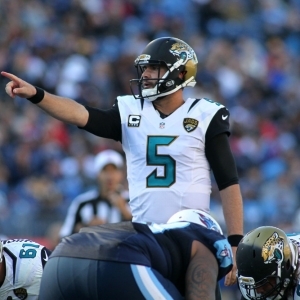 Key trend: Jags 4-6 ATS in past 10 as road favorite - hasn't happened since 2011. Dec. 31 at Titans (TBA): No Week 17 line as usual. I truly believe this game has a better chance of deciding the AFC South Division than the Week 17 Colts-Texans game does. It's the fifth time in team history that Jacksonville concludes the regular season with two games on the road. The Jaguars lost 36-22 in Nashville on a Thursday in Week 8 last year. They allowed 494 yards of offense. Bortles threw for 337 yards and three scores. Key trend: Jags 5-4-1 ATS in past 10 at Titans.